Aud's new A8 is the first production car with Level 3 autonomy. 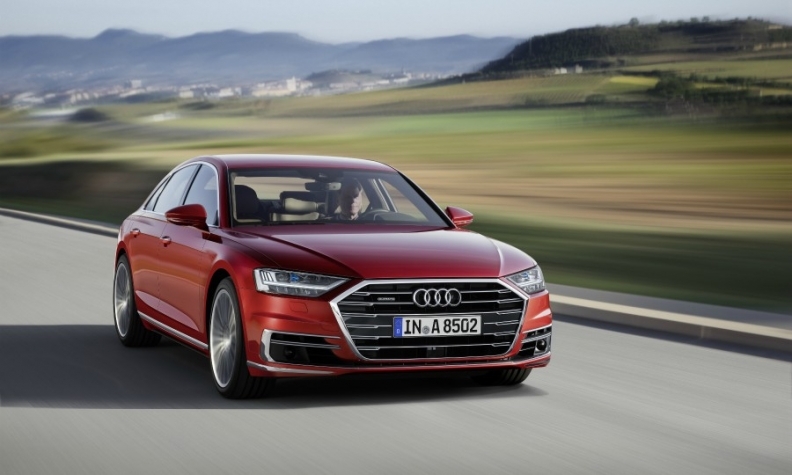 FRANKFURT -- Audi's new A8 may be the only series production car capable of piloting itself along highways while the driver watches the on-board TV, but it may take until the end of the decade before countries can agree on how to validate and approve its Level 3 self-driving system. The German government was the first worldwide to broadly legalize self-driving cars with a new law that came into effect June 21 that allowed automated driving as long as a driver is behind the wheel to assume control of the vehicle when necessary. Audi managers say this is only half of the equation: the other is drafting a set of standards that allow the Level 3 systems like its "Traffic Jam Pilot" to be type approved for market. And it could be 2019 before that day comes. "We took the second step [in Germany] before really understanding how the first step will look," said an executive. Generally, automakers selling cars in the European Union are required to submit to regulators detailed technical schematics for everything from door hinges to electronic stability control systems in a process known as homologation, before a new feature can be launched throughout the bloc. This is where the United Nations plays a key role. A global regulatory framework is the responsibility of the UN's Economic Commission for Europe's World Forum for Harmonization of Vehicle Regulations (abbreviated as WP.29). In some cases, it determines type approvals, in others only non-binding global technical regulations (GTRs) depending on how big of a consensus can be reached across over 100 nations. "If you look at the glass on your windshield, on your tires, or other parts of your car, you’ll find a logo with an encircled 'E' – this is the sign that it has been certified. All these components are approved according to UN vehicle regulations," said a regulatory official involved in the process. The WP.29 consists of an inner circle of mainly European signatory nations that formed the body in 1958, as well as an outer circle that can include any UN member state that doesn’t want to be legally bound by the forum's decisions. The latter, which includes the U.S. and China, agreed to be a part of this looser knit system formed in 1998. The hope is to remove as many non-tariff trade barriers among nations as possible by mutually recognizing that certain products conform to a common set of requirements, so the outer circle serves as a starting point for homologation discussions. "We first try under the 1998 framework because it encompasses more member states and our job first and foremost is to harmonize standards across as many borders as possible. But that is not always feasible for various reasons, and in the current case of autonomous driving, this is being handled by the parties to the 1958 agreement," said François Guichard, expert in charge of autonomous driving at the UNECE secretariat of WP.29. "But that does not mean that countries like China and the U.S. are neither present nor contribute to the discussions. Even if they don't technically have a vote [since they are not signatories to the 1958 agreement], they have recognized experts in the field. Their feedback would likely be incorporated, since their concerns tend to be shared by others -- we're all in the same boat after all, so it's a pragmatic approach." The European Union applies WP.29 regulations for the single market, which are then upheld and enforced by national authorities including Germany's KBA motor transportation authority. As soon as one agency such the KBA or the RDW in the Netherlands permits a car to be sold in their domestic market, this approval then applies to all other member states as well – a system very similar to banks' "passporting" rights that underpin the EU's financial services industry. Like in any multilateral organization, however, there are countries that push ahead and there are those that slow down the process. Part of the problem, according to an industry source directly involved in the discussions, is that few countries in the UNECE have auto industries that are actively pushing the agenda, so the political will is not the same as in Germany. Some are not yet sufficiently satisfied that all of their concerns have been thoroughly addressed, and fear rushing things could endanger lives. In order to remove some of the mystery about piloted driving, Audi has sought to educate policymakers how the technology works, often with some success, according to company sources. Transportation policymakers ultimately recognize the benefits of autonomous driving, since it has the ability to reduce accidents, cut down on urban congestion, lower fuel imports and provide personal mobility for children, the blind or the elderly - if implemented correctly that is. Nonetheless Audi acknowledges there is still much to do and that both industry and regulators are in "uncharted territory" as the brand's new research and development boss, Peter Mertens, told Automotive News Europe in an interview. For example, there is no approved test to even validate Level 3 self-driving technology. So when could Audi be in a position to finally introduce its Traffic Jam Pilot autonomous system? Executives are not saying yet, but it could be the end of next year at the earliest before homologation talks within the UNECE body are resolved. "From today's view point, 2019 is a reasonable target to achieve consensus for the homologation of Level 3 vehicles assuming no safety-relevant issues are discovered," said Guichard. "We cannot take the risk to introduce into the transportation system technologies that are less safe than those we have now." While the A8's Level 3 system could then be activated in Germany soon afterwards, other states have yet to update their vehicle operation laws, including all the other signatories to UNECE's Vienna Convention on Road Traffic. Although this international accord was amended last March to permit autonomous driving, Germany has been the only country to update its national legislation to reflect this. Audi is more relaxed in the U.S. because while the A8 goes on sale in Europe by the year-end, its U.S. launch will be in late spring or early summer 2018. By that time Audi will have "a fair amount of clarity" about what the A8 and future vehicles with autonomous technologies will be allowed to do under U.S. laws, Scott Keogh, president of Audi of America, told Automotive News. The good news is there is a strong likelihood that customers who buy the car when it launches may not be penalized. Audi has left open the possibility that it might be able to activate the car's dormant abilities at a later date, since it will come with all the necessary hardware and failsafes, assuming a car buyer purchased the Level 3 option. And like any piece of legislation, there is a loophole. Under the September 2007 EU Directive governing type approvals throughout the single market, a member state can give an exemption to a manufacturer in the case of new technologies. At this point though, sources at Audi view this as more of a last resort. The risk is too great that it might go out with a product at launch that ultimately doesn't receive broad-based approval when all parties to the WP.29 finally reaches a decision.